T&R Test Equipment is a market leader in the field of protection test equipment equipment. The range includes primary and secondary current injection equipment up to 6000 Amps, voltage sources, micro-ohmmeters and high voltage test systems up to 100kV. 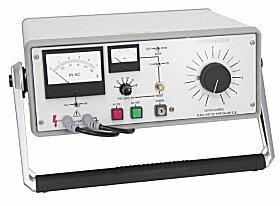 The KV5-100 high Voltage test set is a general purpose test instrument designed for testing insulation systems and the measurement breakdown voltage on electrical plant and components. The unit has an output voltage adjustable from zero to 5kV with accurate metering on both the output voltage and current. A zero-voltage interlock is provided, ensuring that the output may only be energised with the voltage control at zero. The output voltage is metered by a large, linear analog instrument with dual-scale marking of 0 to 3kV and 0 to 6kV. Load current is measured by a second analog instrument with 0 to 10 scale marking. Two current ranges are selectable: 0 to 10mA and 0 to 100mA. Continuously variable output voltage 0 to 5kV AC. Variable trip circuit 2 to 12mA and 20 to 120mA. Output voltage and current metering. Visual and audible indication of test piece failure. Burn feature giving 100mA maximum current on short circuit. Key operated switch preventing unauthorised operation. of BS EN 61010, and is CE marked. The test object and output are protected by an adjustable current trip linked to the current metering range. The trip level may be set to 20 to 120% of the current metering range on 20% steps. Breakdown of the test object is both audibly and visibly indicated. The alarm must be manually reset after a trip condition before testing can be resumed. The instrument is supplied in a compact and portable case with permanently connected test leads. The test leads are terminated in clips. The instrument is designed for operation in conjunction with a suitable interlocked test enclosure or high voltage test area. The KV5-100 Instrument is one of a range of high voltage test systems available from T&R Test Equipment.